Changing demographics and lifestyles in China are the reasons behind emerging opportunities for foreign companies to operate hospitals, clinics and care homes in the country. And the need is now widening to include primary care, rehabilitation and elder care. The range of incentives for foreign investors is increasingly wide. But there remain hurdles to be overcome. In China over the past 20 years, rapid change has been a constant theme. These changes have now, finally, reached the healthcare services sector. As a result, many new opportunities are emerging for foreign companies interested in operating hospitals, clinics and care homes in China. In the 1990s, w saw a boom in foreign investment in many different sectors, from hotels to cars to beer industry. In the decade from 2000 to 2010, China was known to become the factory of the world. Foreign companies like Philips and Sanofi invested in manufacturing and selling pharmaceuticals and medical devices, both locally and for export, eventually coming to dominate the local branded pharma and medical device markets. But other sectors, including healthcare services, remained largely closed to foreign companies. Now, the domestic market is becoming an ever more important driver of growth. Consumer consumption is the key. This means hanging lifestyles, less healthy eating habits, less exercise, less Tai Qi and more TV. And as a result, more: Non-Communicable Diseases (NCD). 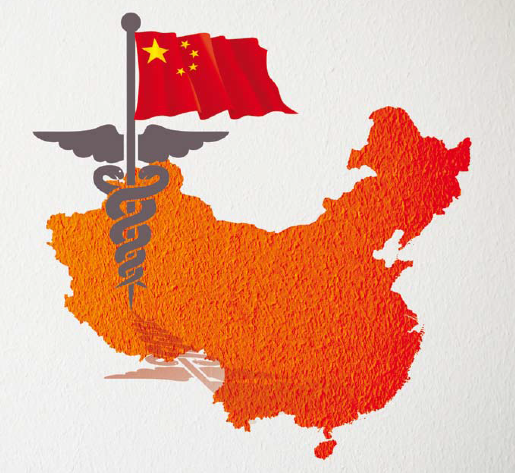 Coupled with an ageing population which will see 47 per cent more people, aged over 40 in 2024, than in 2014, and the lack of a well-structured and appropriately-resourced primary care system, this is placing China’s healthcare sector under great strain. While these trends are not unique to China—we see a similar pattern in India, Southeast Asia, the UK and the US for example—China’s healthcare services sector is struggling to cope with demand. In response, the government is now allowing greater scope for market forces to operate and opening up the private hospital sector to foreign investment to help relieve that pressure. There are now about 26,000 hospitals in China, more than in any other country; 60 per cent are public and 40 percent are in the private sector. China has about 10,000 private hospitals which are already in operation, and several hundred are opening or being upgraded from clinics to hospital status every year. The rapid rate of urbanisation is driving growth and demand for healthcare and at the same time is putting huge pressure on China’s already weak healthcare system. China already has five cities with a population of over 10 million: Beijing, Tianjin, Shanghai, Shenzhen and Guangzhou. By contrast, India has only three, and the US has just two. China also has 14 cities with a population of more than 5 million. But only about 54 per cent of China’s 1.4 billion population lives in cities —compared to 80 per cent in most developed countries—and this figure is set to hit 60 per cent by 2020. This will continue to create huge urban markets for healthcare of all types. Meeting healthcare demands in the urban areas is already a huge challenge, but at the same time the government is aiming to improve healthcare in rural areas and at ‘grassroots’ level, creating opportunities for companiesthere.While health spending is much higher in urban areas, the share of spend in rural areas is now increasing. This current situation, with such a great need for new medical institutions, is a once in a lifetime window of opportunity for both local and foreign hospital groups and investors, as the scale of healthcare infrastructure that the country needs is huge. 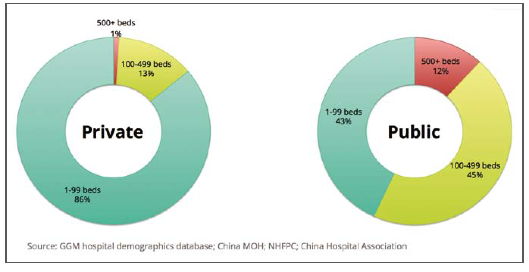 Private hospitals in China tend to be smaller than public hospitals. Almost 90 per cent of them have fewer than 100 beds, and there are very few large private hospitals with more than 500 beds. By contrast, more than half the public hospitals have over 100 beds, and there are 2,000 ‘Level III’ large public tertiary hospitals. Six out of every ten private hospitals are specialised in China. As a result, the private sector is very important when it comes to delivering specialised care such as Traditional Chinese Medicine, maternity services and orthopaedic treatment. There are also hundreds of specialised eye hospitals, dental hospitals, plastic surgery hospitals and rehabilitation hospitals around the country, among others. 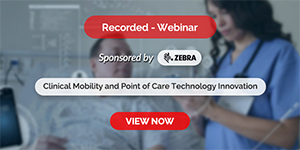 Looking more closely at the investment opportunity in healthcare services, a wave of foreign investments in secondary care has already started, with some organisations already pushing into tertiary care. The opportunities are now widening to include primary care, rehabilitation and elder care. Rehabilitation and elder care are currently big growth areas, as the Chinese government is seeking to find ways to reduce the impending stress these areas are expecting, as demographic and disease profile changes take effect in the coming years. Many foreign hospital groups are now investing in China, including Columbia from the US, IHG, Optegra and Sinophi from the UK, IHH from Malaysia with its well-known Parkway brand, Raffles Group from Singapore, and Ramsay from Australia. And many of the facilities in creation are world class. There are two main themes in China’s healthcare reforms that are currently under way: First, improving the public sector, and second, allowing market forces to come into play. China’s government is hoping that foreign investment will relieve the burden on the public sector, and close the gap in availability of care between East and West China. 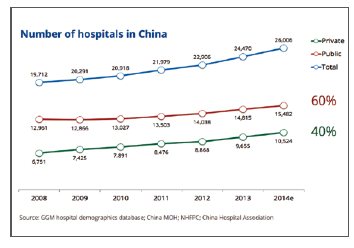 That is partly why we are now seeing a rise in private sector hospitals in West China. For example, more than half of the hospitals in the western provinces of Sichuan, Guizhou and Yunnan are privately owned. In almost all other provinces, healthcare provision is dominated by public sector institutions. Reforms were first announced five years ago and investment momentum started to build in 2011, but it was only in 2014 that the government announced it would be “reducing restrictions on foreign ownership in medical Joint Ventures (JVs) and collaborations”. Later in the same year 100 per cent foreign ownership became possible, and the first wholly foreign-owned hospital was established by German company Artemedin in Shanghai Free Trade Zone. In a 2015 Global Growth Markets survey about Digital Health among hospital doctors and managers in China, and other countries in Asia, analysts found a very high level of support for digital health in China. In fact, it was the highest in the region, with 48 per cent of respondents saying that they believe various aspects of digital health are likely to improve patient outcomes in the next three to five years. The average for Asia as a whole was only 23 per cent. It appears that China’s clinicians and hospital management have recognised health tech as one possible solution which could contribute to alleviating some of the huge challenges healthcare is facing in the country. In the public sector, telemedicine is the technology which is attracting most attention, as national telemedicine initiatives are developed. But it is in the private sector that a much broader level of support for a variety of different digital health technologies is emerging. 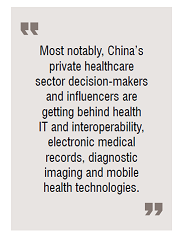 Most notably, China’s private healthcare sector decision-makers and influencers are getting behind health IT and interoperability, electronic medical records, diagnostic imaging and mobile health technologies. For example, medical imaging was mentioned by 75 per cent of respondents from private hospitals but only 53 per cent from public hospitals. The range of incentives for foreign investors is increasingly wide. Relaxing restrictions on foreign ownership is the starting point. In 2015 it was announced that 100 per cent ownership would be allowed in some select locations, namely Beijing, Tianjin, Shanghai, Jiangsu, Fujian, Guangdong and Hainan. Notably these are all major markets for healthcare services with rapidly expanding middle class and affluent populations possessing the means to spend on private healthcare services. Hainan—a tropical island province to the south of the Chinese mainland—is also the location selected for heavy government investment in facilities for inbound medical tourism. There are now financial incentives available, such as allowing capital from private equity and other sources, allowing equipment leasing rather than purchasing—which means lower up-front investment for hospital operators—and reimbursement from public insurance for care services provided by the private sector. It is also becoming easier to employ foreign doctors. And at the political level, healthcare is near the top of the agenda. This was evident when President Xi Jinping and Vice Premier Liu Yandong visited the UK in mid/late 2015. Attracting inward investment in healthcare services and bringing the UK’s National Health Service expertise to China were important themes for this visit and resulted in the announcement of billions of dollars of investment commitments. These are currently being led by the UK’s International Hospitals Group (IHG) and China’s Wanda Group – a 10-year exclusive partnership that involves building and managing the new 200 bed IHG Qingdao International Hospital and future projects in Shanghai and Chengdu. There are, of course, also many hurdles to be overcome by aspiring investors. Rules set by Beijing are implemented in practice at the provincial or city level, meaning the eventual reality on the ground may be quite different from the theoretical letter of the law as written by central government mandarins. The practical application of many of the investment incentives mentioned above is often not a simple issue. For example, an investor may gain permission to establish a children’s hospital while at the same time, regulations may prevent the same investor from employing any paediatricians. Restrictions—both written and unwritten—on doctors working in the private sector present a major issue for private hospital employers. The vast majority of doctors are used to the concept of a job for life in the public sector, along with the loyalty that implies, and are reluctant to jeopardise their position by taking work in the private sector. Unrealistic expectations among investment partners—both foreign investors and their Chinese counterparts —and a lack of experience among Chinese hospital managers in private hospital group management are also regular sources of difficulties. A good example of this is Ramsay Health Care’s scrapping of its proposed hospital joint venture in Chengdu in March 2016 due to ‘a number of threshold conditions precedent not being satisfied’. The private hospital operator, along with Malaysian partner Sime Darby Bhd, had signed a deal in May 2015 to invest US$135 million in a joint venture with Chinese healthcare group Chengdu Jinxin Healthcare Investment. Finally, while 95 per cent of the population now has some form of state health insurance, the reimbursement level is often not enough to pay for private care, even though regulations may allow spending public money to pay for private care. Ultimately, healthcare is about people and about patients. China is becoming older, with 166 million more people aged over 40 by 2024 – a huge increase. Lifestyles are changing, more and more people have NCDs such as diabetes and hypertension, and the healthcare system is under huge pressure. It is fortunate, though perhaps ironic, that the increase in wealth which is partly the cause of these lifestyle diseases will also allow millions of people to pay for private healthcare. Pete Read is CEO of market information company Global Growth Markets (GGM). He specialises in China and other emerging markets and has led many assignments for some of the most successful healthcare companies. GGM delivers market data and insights primarily in healthcare and med tech, helping companies to succeed in their targeted growth markets.